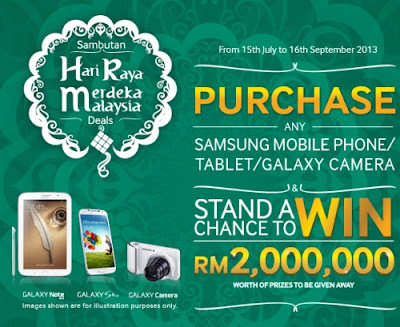 Purchase any SAMSUNG Mobile Phone/ Tablet/ Galaxy Camera from any SAMSUNG Authorized Dealer during the Contest Period and retain the original receipt and warranty card as proof of purchase. Request the relevant Dealer to register your purchased product's e-Warranty. SMS as follow: Type (SAMSUNG)(IC/ Passport Number)(receipt amount RM00.00)(receipt date DDMMYY)(15-digit IMEI number)(name) and SMS to 32632. Visit Samsung website for more details.